I contacted Olivia on a Wednesday afternoon about constructing neutral slipcovers for a red leather upholstered chaise w/back cushion and bolster pillow. Olivia came out the next morning with loads of fabric samples in hand and helped me pick the perfect fabric and color to coordinate with my other furnishings and colors in my home. We picked a beautiful 'ultra suede/microfiber' in a gorgeous camel/beige neutral. She quoted a price on which we agreed (the price was in line with my expectations), took my chaise w/cushion and bolster pillow and said 'give me three weeks'. I was nervous about how the slipcovers would look, not having seen it done - but Olivia had sent me pics of her other work, and it was beautiful, so I was comfortable in her ability to 'make it work'. In less than a week and a half (with a holiday included), Olivia called and said 'we're ready to deliver'! (Olivia obviously believes in the philosophy 'under-promise and over-deliver'). 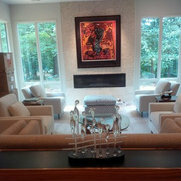 I was thrilled, but still nervous..... Well: NOW I AM LOOKING FOR OTHER PIECES I CAN HAVE ATLANTA CRAFTSMAN WORK FOR ME! Olivia's workmanship is absolutely superb, and the slipcovers on the chaise/cushion/bolster do not look like slipcovers - the piece looks like a brand new chaise upholstered in rich suede with matching back cushion and bolster! And I still have the flexibility of easily removing the neutral slipcovers via cleverly hidden zippers to show the pop of red leather when I want (during cooler months when I want to 'warm things up a bit'!). I cannot say enough good things about the beauty and expert workmanship in Olivia's work - except that I will never call anyone else to do upholstery work for me; and I cannot stop looking at my 'new' chaise! 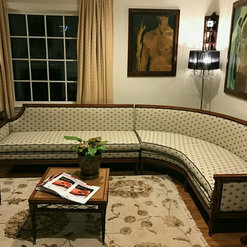 Atlanta Craftsman doesn't just 'make it work' - Atlanta Craftsman makes it EXTRAORDINARY!!! !